Halloween is a time for celebration, not just any normal celebration, but wacky and over the top celebration. And an over the top celebration calls for an over the top makeup too! 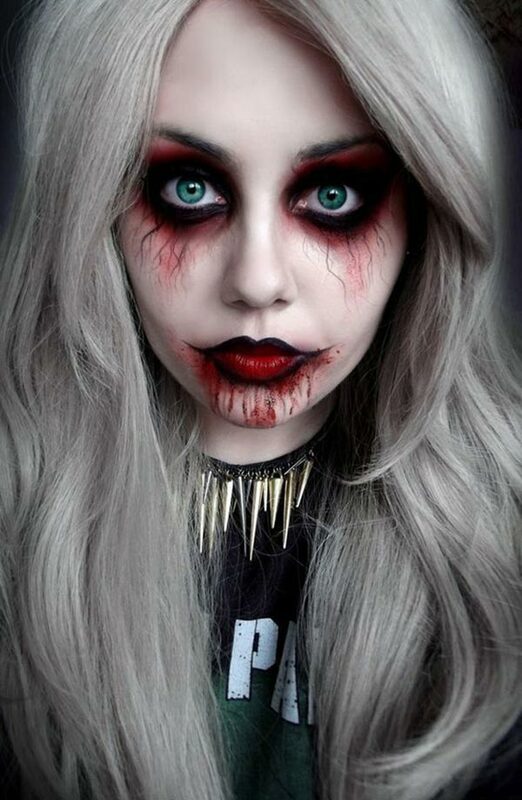 During Halloween, women do not just dress up crazily, but put on quirky and dramatic makeup too. After all, the makeup must complement the costume. 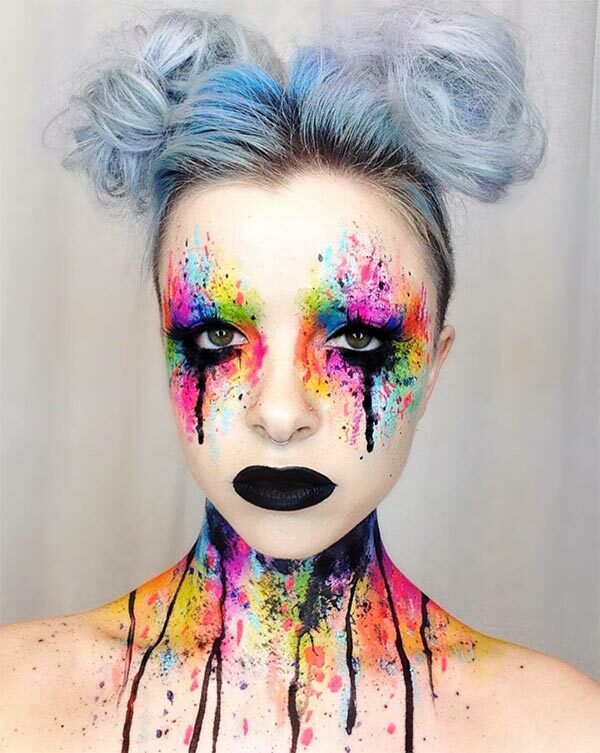 So if you’re looking for some eye catching and unique makeup ideas, take a look at our compilation below. 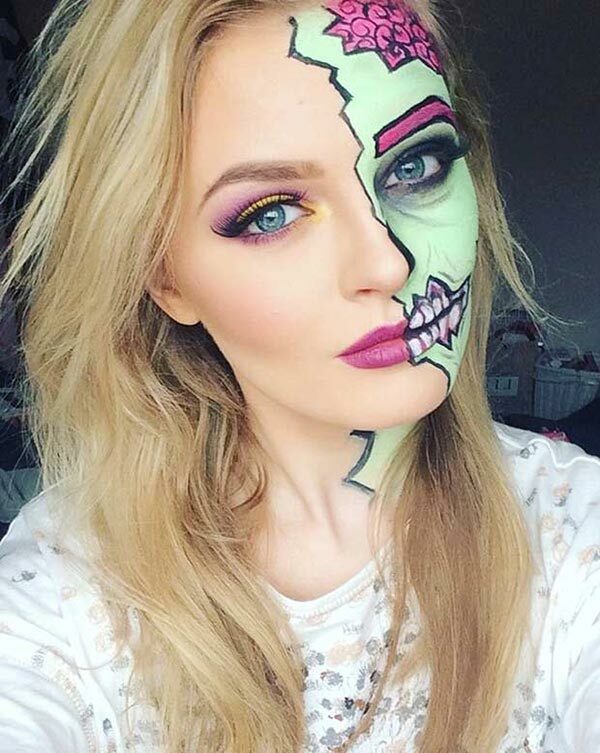 We’ve sorted some of the best Halloween makeup ideas which will be a huge hit in 2017. Take a look! This got us startled for a second. This woman looks exactly like Khaleesi from “Game of Thrones”. We’d suggest you this idea if you’re planning to wear a Khaleesi costume for this Halloween. Why be anything else when you can be Spider Woman? At least you’ll get to fight the bad guys with one of the most popular and most loved superheroes in the world. 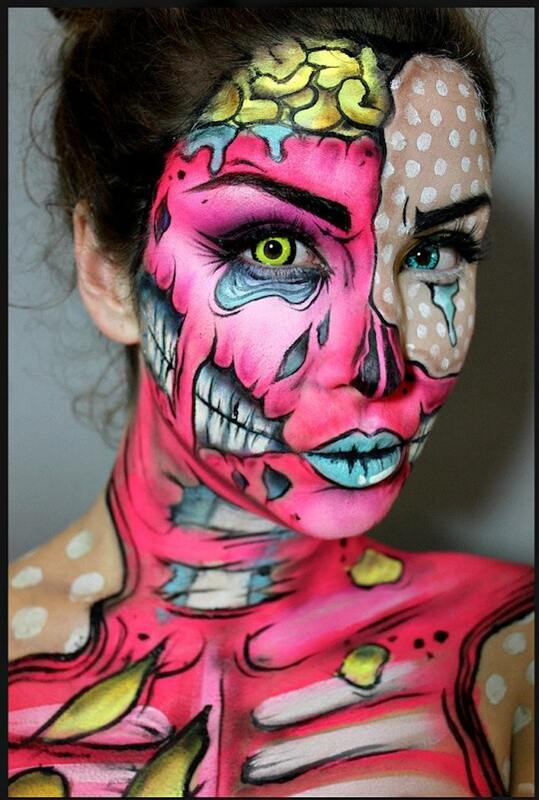 Half face zombie makeup ideas look totally cool. And it’s open to several variations as well. 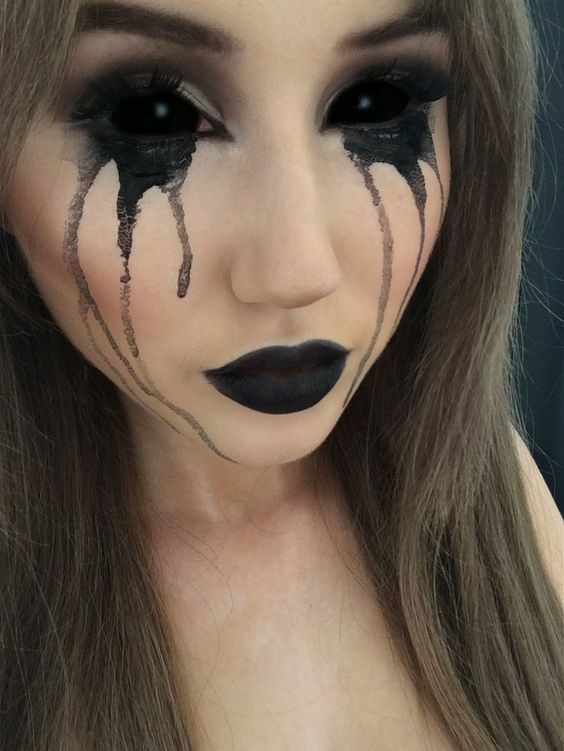 We love the one featured here the most, but also believe that half evil and half good makeup would also look amazing. Showcase your makeup prowess with this icy cool idea. It’s relatively easy to achieve too. Just paint your face white, not literally, and go heavy with the kohl. Don’t forget the lips please. The detailing of this makeup is beyond amazing. We especially liked the eye makeup. This is scary, really scary! It seems like the Red Riding Hood was attacked by the Big Bad Wolf. The eye makeup looks terrific. If only vampires looked so sultry in real life. And we must say this vampire is looking a lot like Angelina Jolie. This is literally a color explosion. And the color has exploded in a good way on this lady. 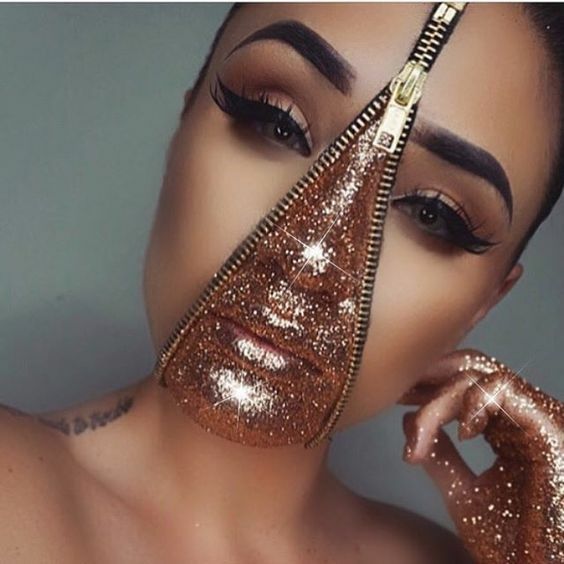 You’ll look totally unique with such a makeup. 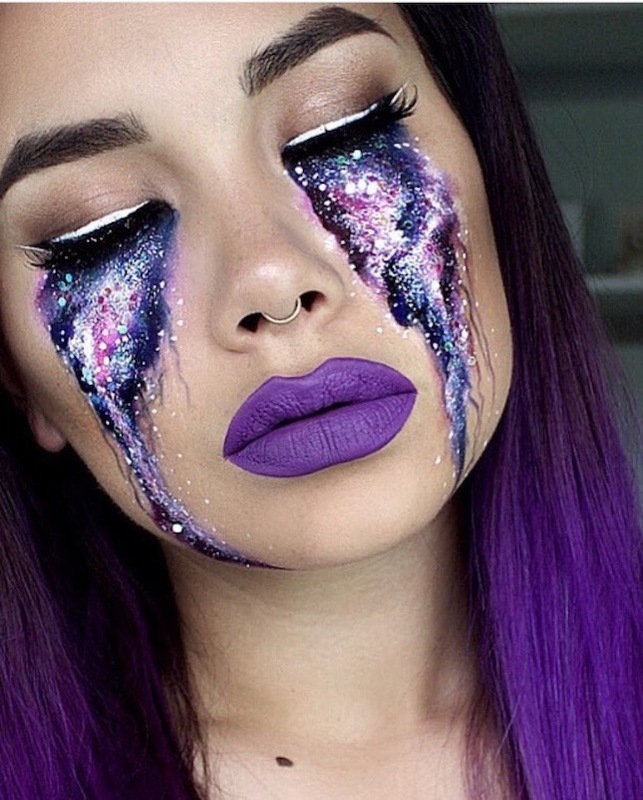 Our jaw literally dropped when we saw this amazing makeup idea. 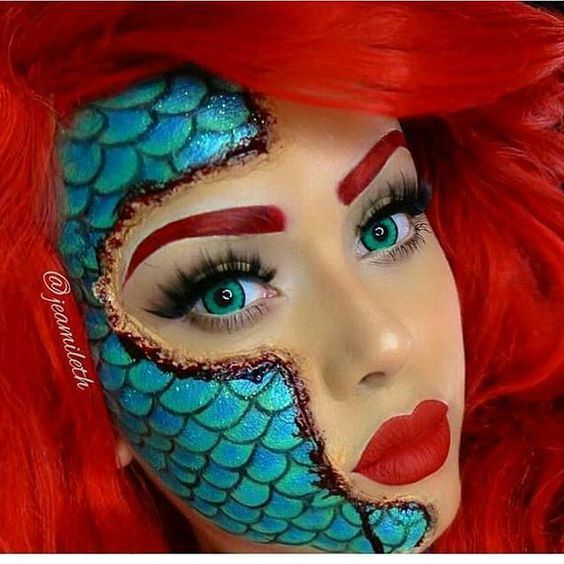 It has to be one of the best Halloween makeup ideas of 2017. 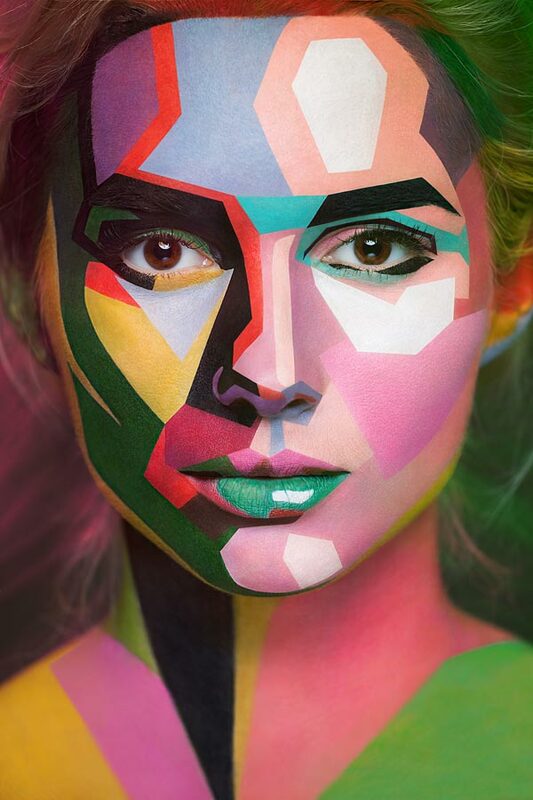 This abstract makeup is also amazing and unique. We love how her hair is done in a pixelated way. This picture definitely deserves more pins. 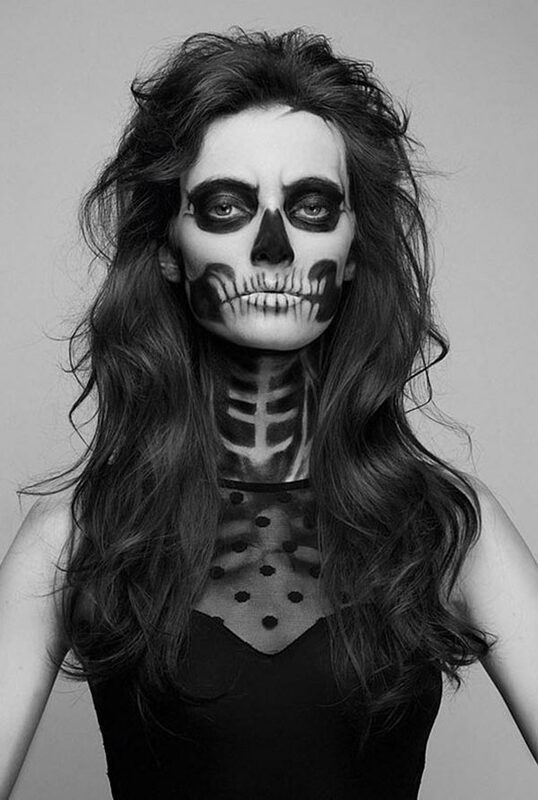 Skull makeup can never go out of style when it comes to Halloween. It just depends how further you’re willing to up the game. The one featured here looks very natural with all the detailing. 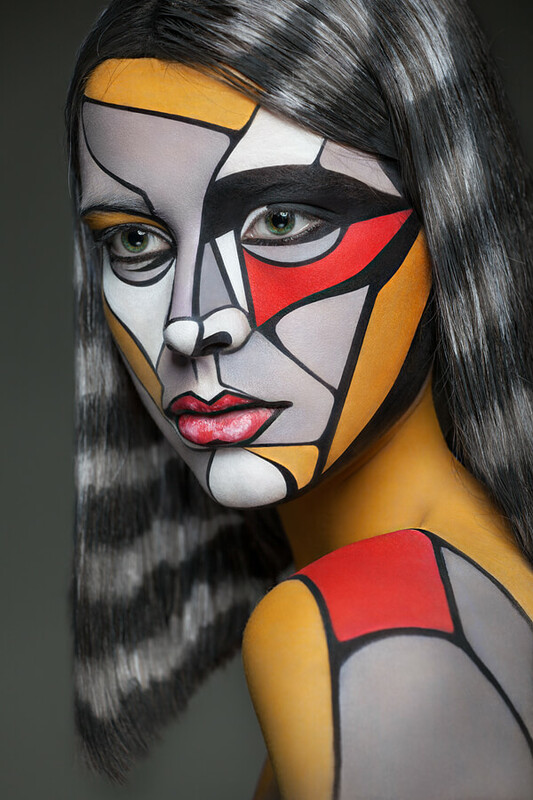 At first, we thought it’s some sort of a picture, but we were appalled to see that it’s actually a girl with some awesome makeup on. 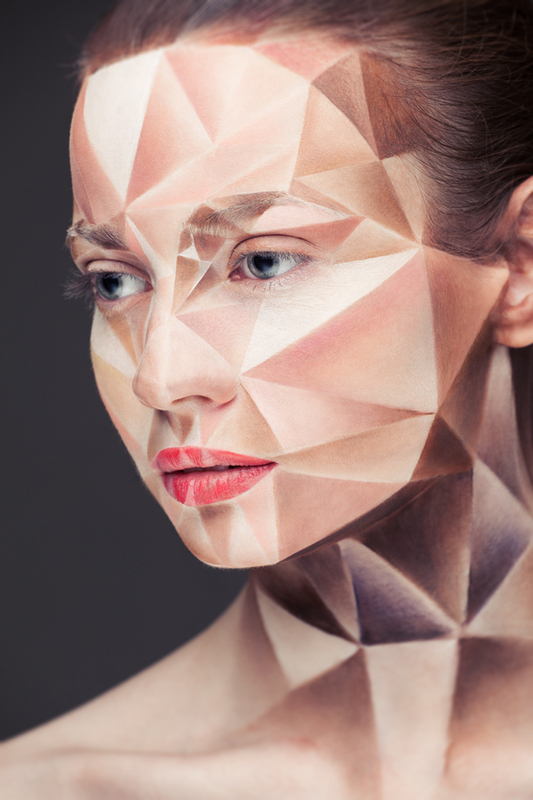 Try this look only if you’re excellent with makeup, or else it can fall flat. 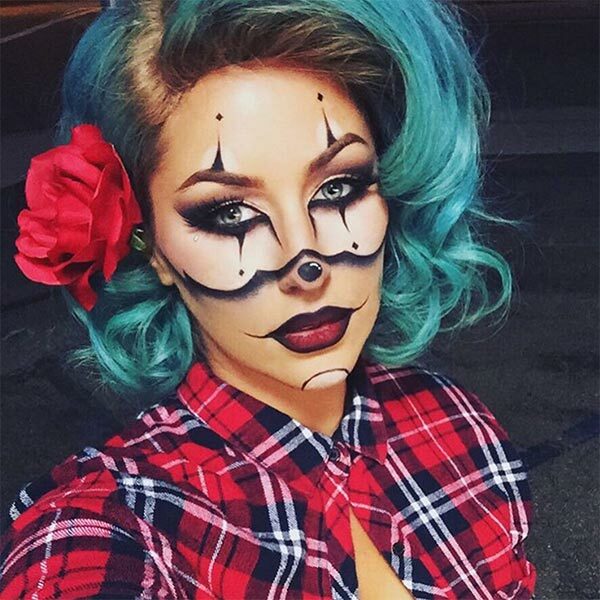 This makeup idea combines two of the most badass things ever- a gangster and a clown. It’s done in a very clever way, with mostly black color used. 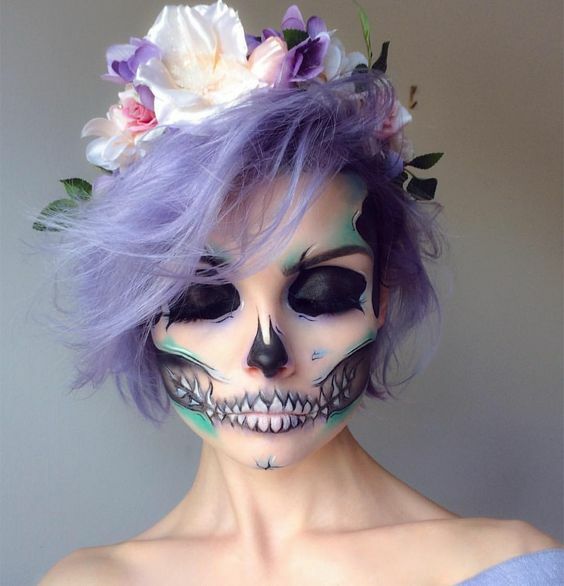 If you want an entirely different skeleton look, especially the one that involves color, you can opt for this makeup idea. 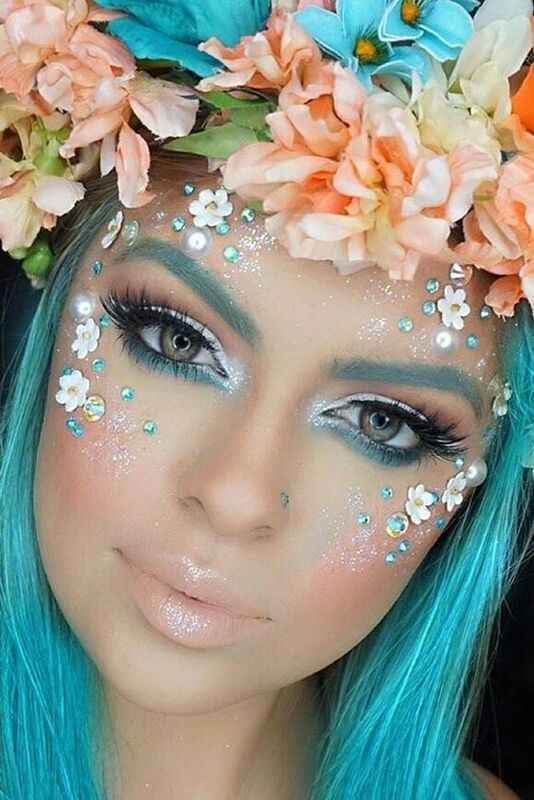 The floral crown is definitely an icing on the cake. 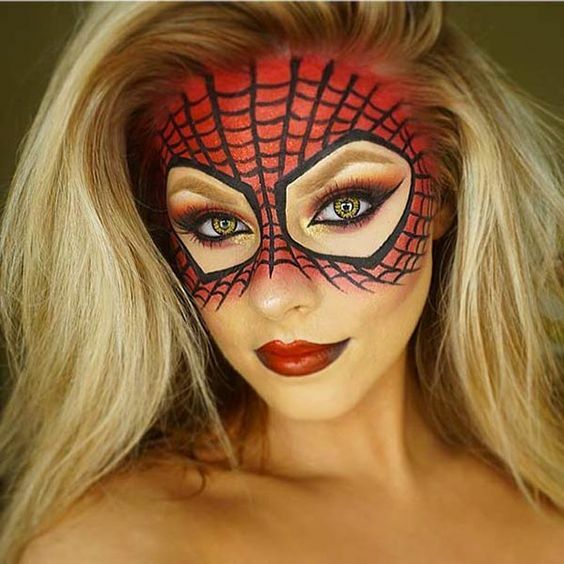 If there’s one idea that’s taking the internet by storm, it’s the comic character inspired makeup. The one featured here is done with absolute finesse. We can’t help, but admire. 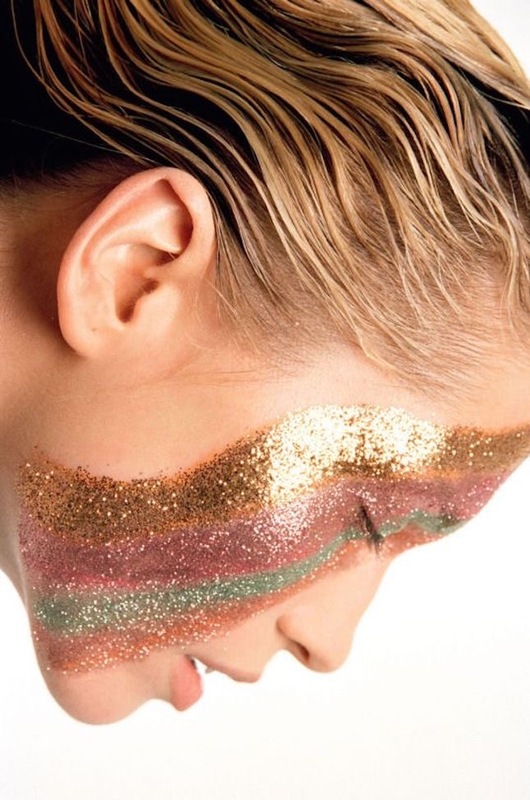 If you wish to stand out of the crowd this Halloween, go for this makeup idea. It just cannot get better than this. 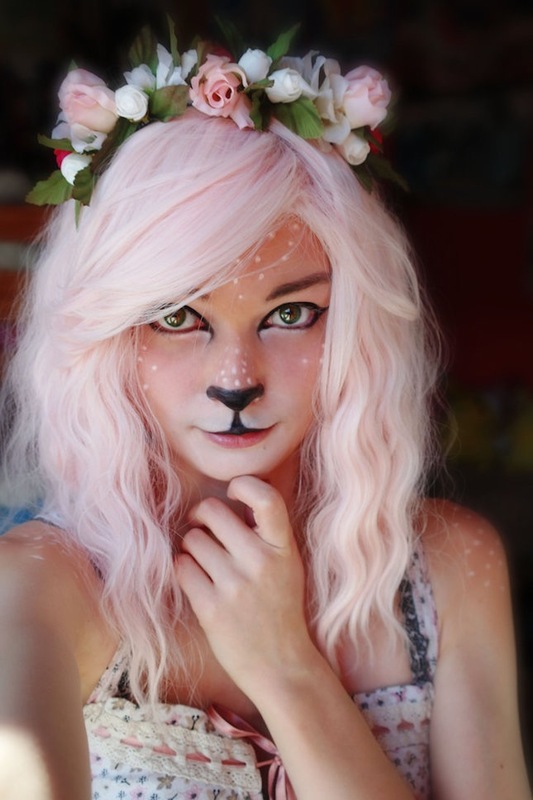 And floral makeup gets a new lift altogether with this idea. This is seriously jaw dropping. The wrinkled skin effect is making it look even better. And the glitter is adding the perfect amount of glitz and glamour. 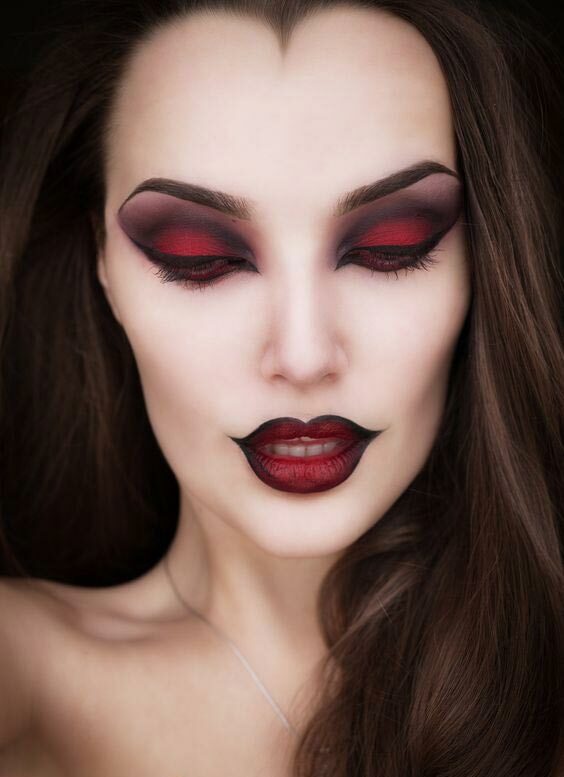 Explore your dark side with the black, gothic eye makeup. It may look scary, but at least, it will go with the theme well. 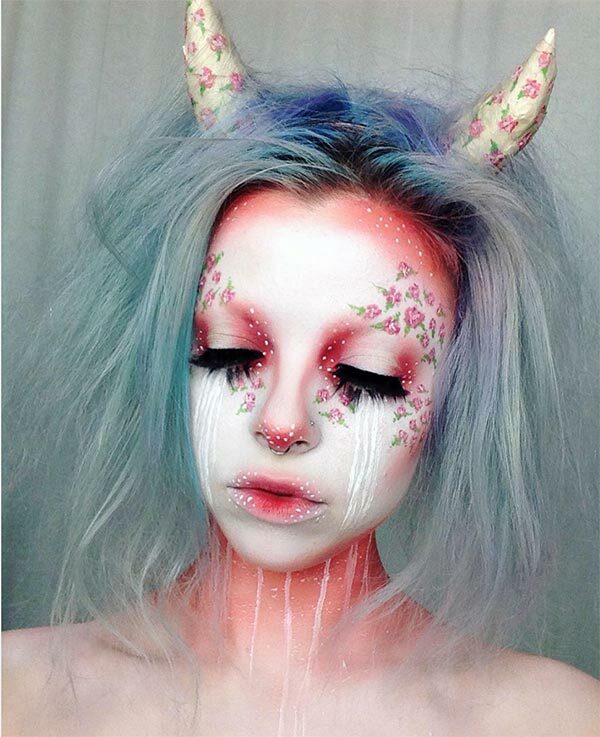 This nymph makeup is truly heavenly. The makeup is kind of subtle as per Halloween standards. It’s the ornaments that are lifting the look. And the floral crown is adding vistas to the look. 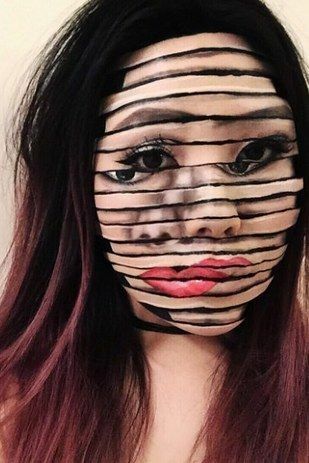 Here’s another unique Halloween makeup idea. I still wonder how the lady achieved the look. Perhaps, a tutorial can help. This makeup is really trippy and even time consuming to an extent. It will surely leave everyone baffled. Yes, we agree that it will be really difficult to achieve, but when it will be done, you’ll be applauded by everyone. Isn’t that Ariel from “Little Mermaid”? Is she getting back to her real self? That would be really difficult for the Prince Eric to cope up. The 3D effect is really amazing. 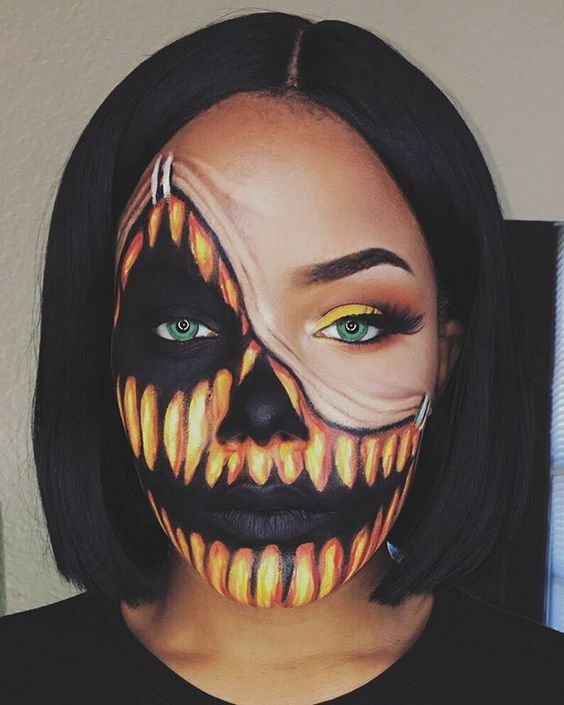 When its Halloween, your best bet would be making use of the Halloween colors for your makeup. We think it’s an evergreen look, considering the colors are typical of Halloween and the skeleton look never goes out of style. Everything about this makeup feels oh so right. The pastel wig is complementing the makeup really well. And the doe-eyed look is seriously beautiful. The floral headband is also amazing. This sparkly look is simply perfect for the mesmerizing Halloween look. And whenever glitter is involved, it has to be amazing. This old classic look would gorgeous anytime you go for it. The heart shaped lipstick takes the cake here. 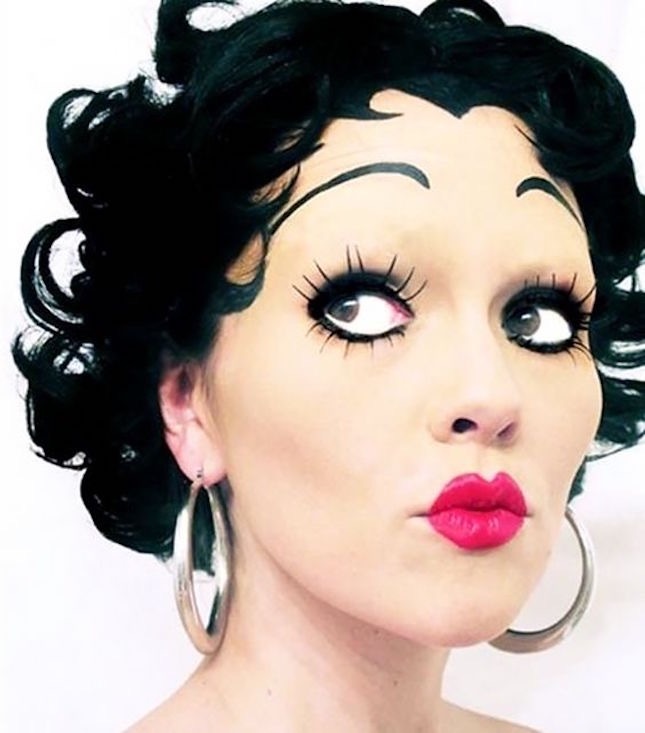 And don’t forget to dress up like Betty Boop for it. 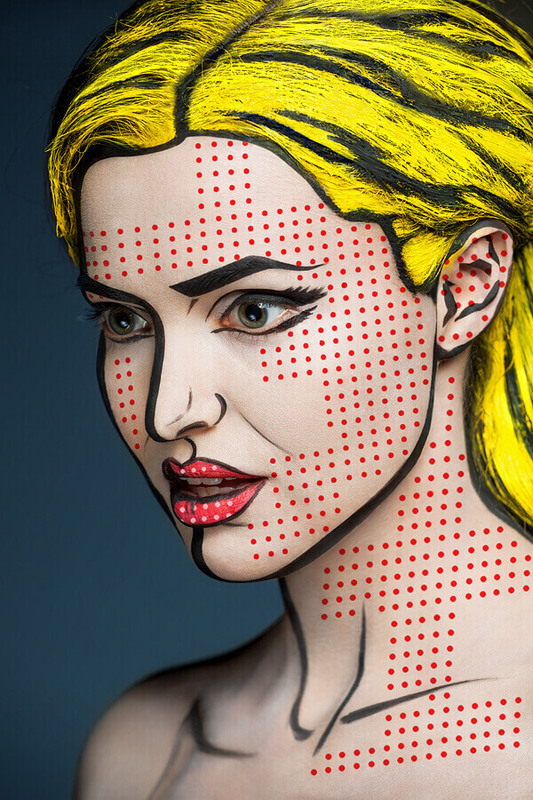 This pop art zombie makeup is guaranteed to turn everyone heads. You need to throw in two contrasting colors to create this unforgettable look. 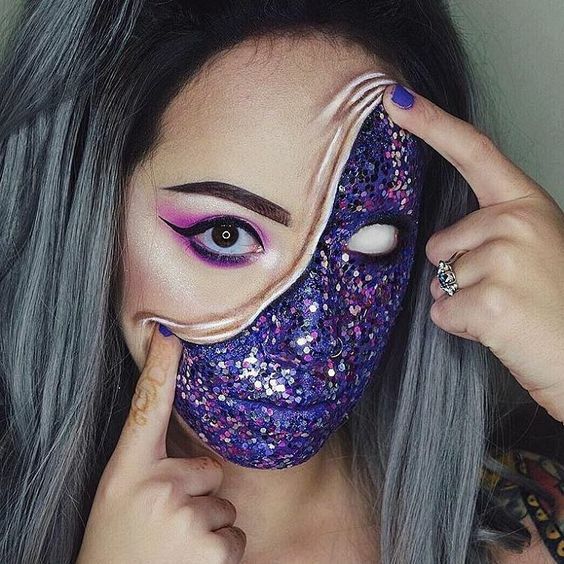 This new take on sugar skull makeup is leaving us breathless. You just need to pair it with extremely long eyelashes. This woman here is crying starfish and glitter and she looks like a fairy. Who could she possibly be? If you want to deck up in a cute way, try out this butterfly makeup. If you’re not a huge fan of orange makeup, you can try any other color you like. 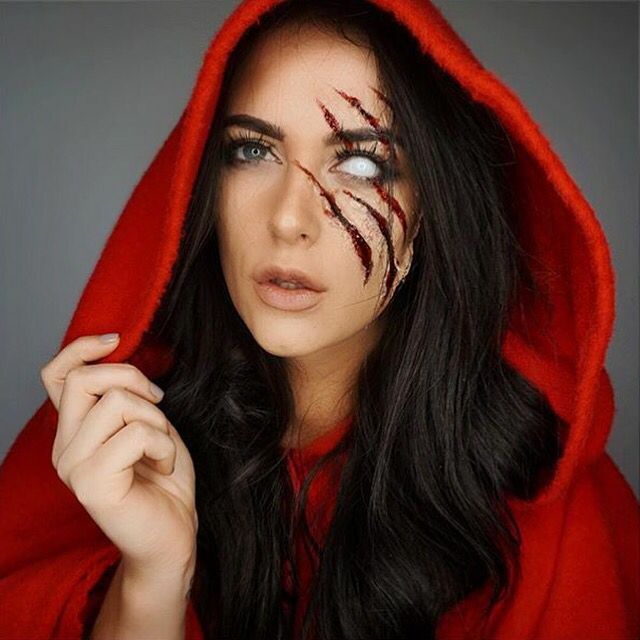 These Halloween makeup ideas for 2017 will take your look that extra mile, which you’ve always wanted to. 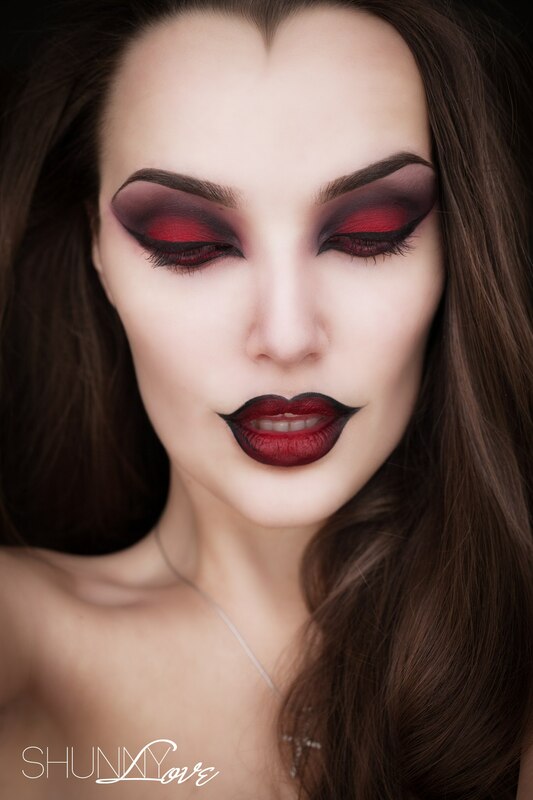 If you have any more tips related to Halloween makeup ideas, let us know in the comment section below.